Above: This color collage shows the base colors most accurately. Below are a variety of photos taken indoors and outdoors (no sun, unfortunately) in different levels of light. Hopefully, you'll get a fairly good idea of how they look in real life. Below: For reference, the colors on the board are 1)Blue Hawaii, 2)Fresh Mint, 3)Dazzling Orange (this is not orange, but actually yellow), 4)Twinkle Peach (more pink than peach), 5)Sparkling Cassis, 6)Bishop's Weed, 7)Calendula for Joy, 8)Rose, I Love You. 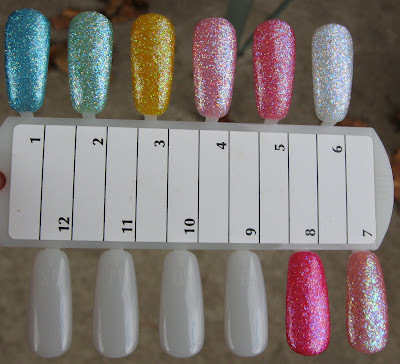 Last week I showed you bottle pictures of the 8 new Color Club Japanese Exclusive Glitters that Yen from Victoria Nail Supply sent me, and I received a polish wheel with the swatches from her today. I'm guessing they should have these in stock by the end of the month. Naturally, Fresh Mint was the one I was most looking forward to, but now that I have the swatches in front of me, there's a 3-way tie for my affections between Fresh Mint, Blue Hawaii and Rose, I Love You! Let me explain why...Fresh Mint is green, so that's my reason for liking it, pure and simple. Blue Hawaii is blue, so can I use the same reason I used for Fresh Mint? 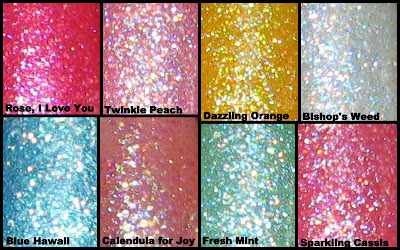 Rose, I Love You is a shade or two below a fuchsia, but it looks holographic because of the fine glitter and the color combination between the base color and the glitter. Bishop's Weed is another favorite of mine because it reminds me of new fallen snow with the sunlight reflecting off of it. I like the range of colors in this set, as there's much more variety than in the original 4 that they carry (2 pinks, a peachy pink and my favorite, Too Violet). 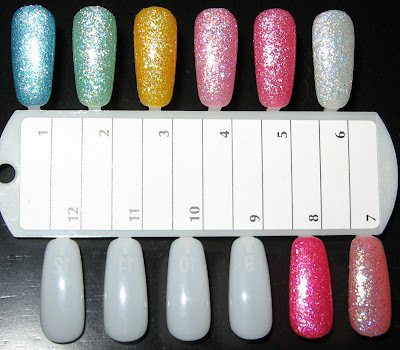 These are all packed with micro fine holographic glitter, giving them a flash of different colors, depending on the base shade. At different angles, they take on an almost foil finish, because the glitter is so dense. What do you think? Any favorites among these for you? Wow! These look great :) I think i need 1 and 8 for sure! That yellowy one is getting my attention...but it is actually orange!!? Rose I Love You and Blue HAwaii look fab, also!! In fact, these all look super gorgeous, thanks for the great post! I have Blue Hawaii already. The rest I will have to buy. Fresh Mint and Rose I Love You are the two I'm most interested in. They are all gorgeous, I just want the bottles to look at. I am still scared of glitter. That yellow/orange one rules! 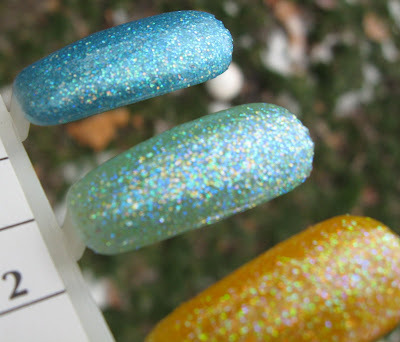 It's funny that both China Glaze and Color Club have a Blue Hawaii, and that they were both meant for Japan. I'm glad I can get them now! Very pretty. I think I need that gold one! I think they are gorgeous !!! I can't even pick my favorites this time, they are all so beasutiful ! I will have to find a way to get them ! AllYouDesire~they are all quite lovely, but I'll probably pass on 3 of them, as they look similar to the original ones. Euridice~it's yellow, but the name says orange, I don't understand! Lucy~those 2 are on my list as well! Evil Angel~these actually remove fairly well, don't be afraid! They are pretty just to look at too though. Get Nailed~you are all changing my mind on the yellow, I thought I didn't want it but now I don't know! Tuli~they are pretty, and such a better variety of shades this time. Jackie S.~they're in at VNS, just not on the site. Any day now! Hi, love your blog been reading for a while. 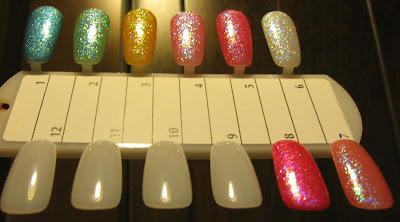 It's a breath of fresh air in the sea of nail blogs. You are one of the more, I feel at least easy going and approachable bloggers. You do good work! I have a question for you also where did you purchase the nail board in this post, I know where to find the nail wheels but the boards or whatever they are called I haven't been able to find.. Thanks so much! Thank you very much!!! yea I saw those ones on trans design I thought that they were from victora's and I clicked you link only to find out she was closed. Drats! Anyway I will try her when she opens I was able to source some OPI ones so when victoria re opens I will have some comparision shopping to do. Thank you so much for replying. I will continue to enjoy your blog.